Two-way independent control, can be switched to 0V, 3.3V and 5V. 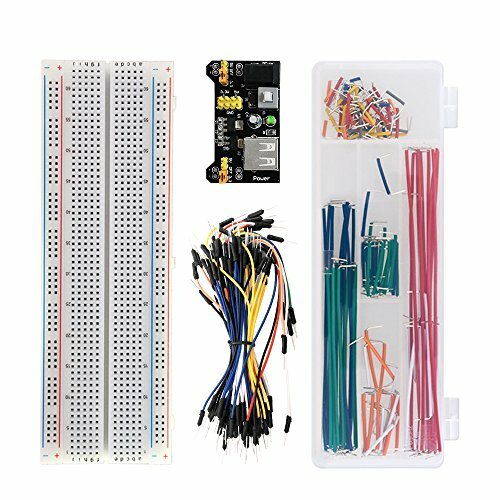 M/M breadboard jumper wire pack, totally 65 pieces in several types of length and many colors. These flexible jumper wires are basic component that connects two or more devices. They are produced in many colors so you can easily pick up the right one when lots are plugged. They provide an easy way to build your own circuitry on a breadboard. 2) Comes as one pack of 65 jumper wires with an assortment of colors and length. 3) Perfect design for breadboards and Arduino. 4) Easy to build your own circuitry on breadboard. Included with this kit are 14 various lengths of 22AWG wire - 3, 5, 8, 10, 13, 15, 19, 21, 23, 26, 51, 77, 103, and 126mm - 10 pieces of each.